A big thank you to everyone that sent in mailbag questions throughout the off-season. It has been fun to write on a variety of baseball related topics. This concept has generated some great discussion here at Twins Daily. With the season starting, I will be shifting away from the mailbag and diving into some regular season stories. Thanks again to everyone that submitted questions. Enjoy the off-season’s final mailbag article. Baseball’s new rules are certainly going to take some adjustment time. The three-batter minimum for pitchers is going to be one of the toughest adjustments but there are some ways to avoid the problem. An end of an inning can also signal the end of a player’s time on the mound. This could be helpful for the LOOGY (left-handed one out guy). If there are two outs in the inning, come in and get the out you need, and your day will be done. There are going to be situational players that are hurt by this rule. Front offices are going to have to change roster construction and managers are going to have to change what they do on the field. I don’t like that it takes away a strategy from teams. I also don’t think it will save that much time, since the ultimate goal is to speed up the pace of play. Minnesota is slowly whittling down the roster. Over the weekend, Tyler Duffey was optioned to Triple-A and Chase De Jong was reassigned to minor league camp. Monday saw Tomas Telis, Brian Navarreto, and Randy Cesar sent to the backfields. This left 41 players in camp including 21 pitchers. There are also 10 non-roster invitees among the 41 remaining players. This will leave some players like Michael Reed open to waivers. Reed has the possibility of latching on with another team as a fourth outfielder, but it wouldn’t surprise me if he made it through waivers. On the offensive side of things, Adam Rosales has been having a great spring. Tom wrote about him as a possible winner of the Sire of Fort Myers. He’s 35-years old and the Twins seem to have some younger options ahead of him on the depth chart. Lucas Duda could have a shot too, but CJ Cron and Tyler Austin are ahead of him. The most likely non-roster choice might be on the mound. Ryne Harper has been outstanding this spring and Minnesota’s bullpen could offer him an opportunity. A player like Trevor Hildenberger has options left. Addison Reed has seen some rough spots this spring. Harper has certainly looked like he has earned a big-league job. Things are definitely going to be different in the Twins clubhouse this season. Spring training already saw some of those changes with workouts and schedules changing. Baldelli is not that far removed from his own career. This should help him relate to his players. He’s also coming from a Tampa organization that was very forward-thinking. As far as leaders in the clubhouse, Nelson Cruz was signed to fill some of that veteran leadership role. He’s been one of the best home run hitters of the last decade and he brings instant credibility. Kyle Gibson is a strong leader in the rotation, and I think he could serve in that capacity for the entire pitching staff. Minnesota is entering the Byron Buxton and Miguel Sano era, so it would be nice to see them take on leadership roles as well. What are your thoughts on this week’s questions? Leave a COMMENT and start the discussion. Be interested to see the fate of Austin. Will he get a temporary roster spot? And Reed, too, since Cave has options. I see Romero will probably start in the minors (and hopefully start). Curious to see how the AAA/AA rosters break out. A lot of names down there for those two teams, and looking at the Twins current minor league system, it is really really pitcher heavy! Also, Adrianza. Is he on the bubble? Could anyone not on the 40-man be added. That is a big hurdle. The Twins aren't exactly rich in release candidates with nearly a dozen minor league prospects on the 40-man. And the death of the situational left, or a pitcher now appearing in more games than innings pitched...that will be a thing of the past! 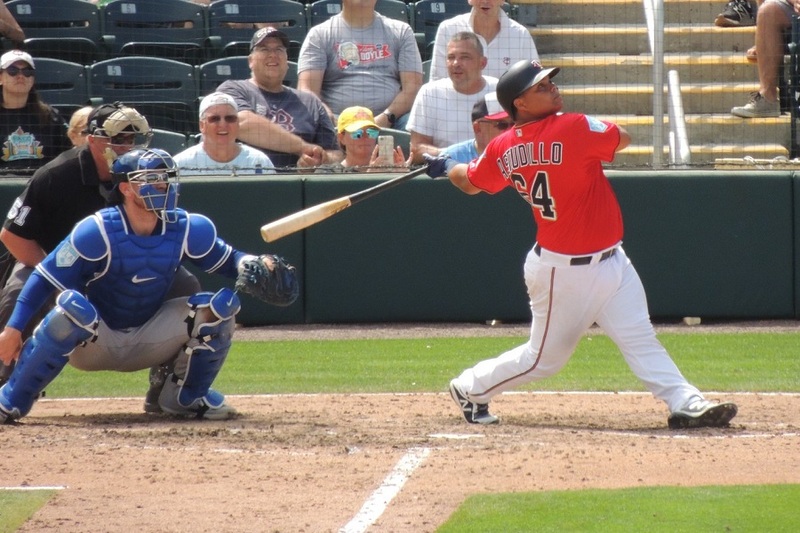 Romero was awful/wild on Sunday, though he wasn't helped by a ball off of Austin at 1B and a bad play by Rosales at 3B. But did I miss something, somewhere, about him going to Rochester to begin the year? I could see it, for various reasons but he's also one of the best arms we have. I am NOT convinced Addison Reed makes the opening roster. After some solid appearances late in 2018 I thought he would be ready following the off season. But he has looked really bad. If you want to put your best team on the field, I'd say Reed is cut over Cave with hope Reed goes unclaimed. But Cave having an option means they could decide to give Reed a little more time. Speaking of options, there are various scenarios where Austin makes the club for an extended audition, especially with Sano beginning the season on the IR. Austin hasn't walked once the entire spring! And he struck out THREE TIMES on Sunday before his HR. But his BA and production and potential are interesting. I think Adrianza is safe. Poor Torreyes, he's destined for Rochester to begin the season. 1] It affects everyone, not just the Twins. 2] Strategy doesn't go away, it just changes. Potentially, it's an interesting change. 3] The end of an inning caveat changes the complexion. EXAMPLE: SP starts an inning and gets 1 out. LHRP comes in to face a LH batter. Gets him out we will say. Then he has to face a RH batter who walks or gets a hit. Unfortunately, it could be a run scoring hit. (Again, the rules affect BOTH teams). Then he faces another LH batter. Three batters, he's done, plus the inning is done. If he can get proposed RH batter out, the inning is done after only two batters. NOT saying I like it, but I don't think strategy is gone, just changed. im not sure what the reasoning behind it is except for maybe sparing us having to watch 3-4 pitching changes per inning. The leaders of the teams will adapt to it....or not. The ones that cannot will fail. I don't think they get rid of Austin. I think he goes north. Personally I won't be upset if Austin doesn't make it and is even lost. IMO he'd likely be a one year asset with Kiriloff, Rocker, and Larnach (forgive the sp) being close and have the ability to play OF. Nice as a bench bat maybe, but what else do you do with him? On the 3-bat rule, which happens next year, how in the world did teams manage before the LOOGY? Seems to me that Reed has made too many fielding mistakes in the outfield. We have better options. Trade Austin to Baltimore, AKA the AAA team cleverly disguised as an MLB team. Pop on the bench is nice, but not sure I trust bringing in a hitter off the bench that strikes out 30+% of the time. I also think losing Austin would lead to some regret. If he has a chance to start, he'd hit 35 HR and could be dangerous in the middle of the lineup somewhere. I bet a lot of teams would be interested in the guy if their 1st baseman goes down for the year. Speaking of which, lord forbid we don't keep Austin and Cron goes down with an injury...going to be some tough decisions in Fort Myers over the next week. As for Addison Reed, I'd be fine if the Twins just cut the guy. I prefer Jake Cave over Reed in the outfield and I think Cave earned his spot after what he did last year. I think Addison Reed will start on the DL. I agree on Cave, not so sure about Austin. Cave earned the 4th OF spot with his performance last year and hasn't done anything to lose that spot in ST.I think it sends a bad message to your team if players who perform at the MLB level get cut in favor of guys who've had the chance and not performed like Reed. I also think that Reed is at least a 50/50 shot to get through waivers given his track record. It woudl take a team with an open spot and not much OF talent to grab him. I think it's more likely he goes down in the last minute 26th man flurry from many teams. Austin is a tough one. He has power but waaaay too many SOs compared to walks in his career. No walks, 13 SOs in spring training. Boom or bust guy. Those guys don't really help your bench much. Problem is that if he could just improve the BB ratio to even 3 or 4 to 1 and drop the SO rate to 20-25% we could really have something. He's got to get consistent ABs to get better and he won't for the Twins. Has to go to AAA or another team. Same issue on both Reed and Austin. Would love to have both at Rochester as injury insurance. I think we have to DFA them on the last possible day, hope they get through, and, if not, try to work a trade. Would love to have both at Rochester as injury insurance. I think we have to DFA them on the last possible day, hope they get through, and, if not, try to work a trade. From what I understand the consensus is there's no way Austin clears waivers. The Twins will lose him if they don't bring him north. Curious as to the source of the consensus that there's no way Austin clears waivers. I haven't really seen that said anywhere other than on this board. Of course, I don't read everything and haven't specifically been looking for that information either. It wouldn't really change my opinion on keeping him though. I just don't think he'll develop playing part time and that's all he'll get with the Twins. He really needs to be on a team like Baltimore, Seattle, KC or Detroit and play every day.Maybe a trade is a possibility? It wouldn't really change my opinion on keeping him though. I just don't think he'll develop playing part time and that's all he'll get with the Twins. He really needs to be on a team like Baltimore, Seattle, KC or Detroit and play every day. Maybe a trade is a possibility? Concur. Even if it's true that he'll be picked up, I don't really care. He won't be a big loss. I'd be looking to trade a number of our Bench players, for some minor league players. We have back-ups to our back-ups with young guys on the way. I think it's pretty normal for fans of teams like the Twins to take solace in the fact that our farm system is stacked. But that said: you never know which of these minor leaguers will actually work out. The odds highly unlikely that Kiriloff, Larnach, Lewis, Gordon, and Rooker are all going to be future all-stars. In fact some of them may not even get more than a cup of coffee. Like it or not, none of these prospects I just mentioned have proven anything in the bigs, and out of the 5 I listed the odds are that 1 of them becomes a long-term every-day player. That's why you can't just "trade your bench guys". I expect the three batter rule to fail miserably and the owners will ditch it as quickly as they threw it on us. The biggest problem with the 3 batter rule will be, as was touched on briefly by someone, if a guy comes in and just doesn’t have it that night. A game can change dramatically in 3 batters. I think the teams like Baltimore with a high waiver claim will wait to see who is available on waivers. Why make a deal for Austin? Wait and claim him or claim a similar player. If the Orioles are the only team who would have an interest, then that is that. But if some other team, with a lower waiver claim, also would like a first baseman, then our FO can talk turkey with them. Orioles are in first position for waiver claims, right? Unless there's a recent change, up through the first month of the season it's the previous season's records that determine the waiver claim order. So, yes. Addison Reed has shown NOTHING this Spring. Either DL him and send him to the Mayo Clinic or release him and let him count his 8 Million. Meanwhile, try to trade Austin, Reed, and/or Cave for whatever you can get; Out of options pitching or minor league talent.